The Absorbent Wizard Duo Insert is the cloth diaper component of the All-in-Two cloth diaper system. The Wizard Duo Insert - Night Time is made from 100% polyester which has a great deal more technology incorporated than the Unbleached Cotton and Bamboo Terry options! The Stay Dry material keeps your baby feeling completely dry in a wet diaper, which promotes healthier skin and reduces the chance of a rash. 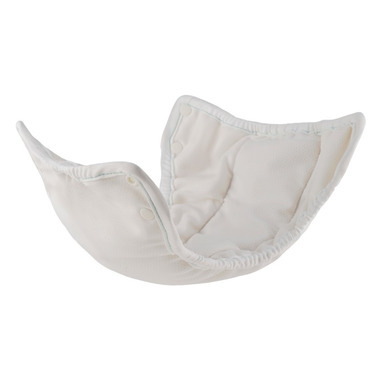 The Night Time Insert is packed with absorbency, creating a leak-free diapering system for 12+ hours! The Duo Insert snaps inside the Duo Cover. Once complete, your All-in-Two cloth diaper is ready to be used on your baby. When the Duo Insert becomes wet or soiled, simply unsnap from the Duo Cover and replace with a clean one, reusing your waterproof Cover 3-4 times before having to launder. Fully Elasticized - elastic is sewn around the entire Insert, creating your first line of defense against leaks! Adjustable Rise - quickly adjust the length of the Duo Insert with the fold over rise for a perfect fit inside your Duo Cover. Stay Dry Barrier - keeps baby feeling completely dry and comfortable and reduces the chance of a rash.